BLOOMINGTON – Bloomington-Normal’s public transit system is preparing bus riders for fare increases that would start this summer, in addition to some other changes including eliminating of one of its routes. Connect Transit held the first of eight so-called “community engagement” sessions Wednesday evening, and plan seven more during the next month. Connect Transit General Manager Isaac Thorne is proposing the first fare hike in 12 years for one-way rides. Increases are also planned for monthly passes and Connect Mobility rides that provide curb-to-curb service for passengers with disabilities. Thorne said the system needs revenue for increased service, including Sunday buses that started running three-years ago. Thorne said it’s wrong to conclude that more revenue is needed because people don’t ride the bus. Ridership continues to grow, according to Thorne, after a one percent increase last year and 2.3 million rides. “Ridership is up 8 1/2 percent this year. We’re also going to see another increase in January,” said Thorne. “I think we’ve had seven or eight straight months of increased ridership. Some of those months have been 10, 12 percent,” Thorne added. 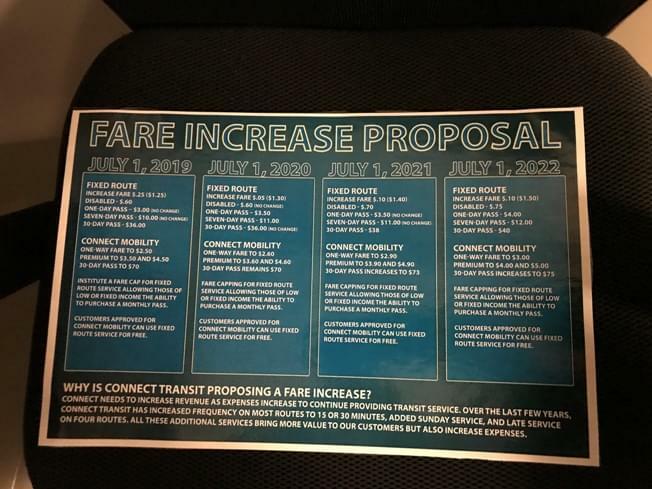 Pending trustees’ approval, one-way fares will increase 25 cents to $1.25 beginning July 1 and rise to $1.50 in July of 2022. Monthly passes would increase from $32 to $36 this summer, and climb to $40 in 2022. Riders can opt for a pay-as-you-go plan for the monthly passes. “A lot of people with low income or on fixed income can not afford a $32 pass or a $36 pass. It allows them the option to pay as they go up to that $36 mark, which we are proposing to have unlimited rides,” said Thorne. Connect Transit also wants to add express service at peak times on the Lime and Red routes to help offset the planned elimination of the Olive route. The Olive route currently takes riders from Main and Orlando in Normal to near Ft. Jesse and Hershey Roads, east of Veterans Parkway. Trustees plan to vote on the fare hikes and route changes after a March 11 public hearing at Normal’s Uptown Station.